1.1	Statutory Authority. The Secretary of the Department of Natural Resources and Environmental Control (Department) establishes and adopts the following Regulations under and pursuant to the authority granted by §§6003 and 6010 of Chapter 60 of Title 7 of the Delaware Code. 1.2.1	Minimum requirements are hereby prescribed governing the location, design, installation, use, disinfection, modification, repair, and sealing of all wells and associated pumping equipment as well as prescribing certain requirements for the protection of public and private potable water supply wells. These Regulations supersede all other well construction Regulations heretofore adopted. 1.2.2	No person shall conduct any activity contrary to the provisions of these Regulations. All such activities that are contracted for shall be carried out only by a person or persons possessing a valid license issued by the Department pursuant to the provisions of 7 Del.C. §6023 and the "Regulations for Licensing Water Well Contractors, Pump Installer Contractors, Well Drillers, Well Drivers and Pump Installers." 1.2.3	These Regulations apply to the entire life of the well, including but not limited to, construction activities from the initial penetration or excavation of the ground surface through development, equipment installation, disinfection and sealing of the well. Set up of construction equipment before actual penetration or excavation is not considered part of construction activities. 1.2.4	Before any well construction activities commence to install any well, as defined in Section 2.0, the property owner or property owner’s authorized agent must obtain the prior approval of the Department to construct the well in the form of a well permit. 1.2.5	If any part of these Regulations or the application of any part thereof is held invalid or unconstitutional, the application of such part to other persons or circumstances and the remainder of these Regulations are not affected thereby and shall be deemed valid and effective. 1.2.6	The Department has the authority to require that the well permit and permit conditions be recorded with the Recorder of Deeds office in the county where the well is located. 1.2.7	These Regulations shall be liberally construed for the protection and conservation of the water resources of the State to protect public heath. 1.2.8	The Department shall have the right to enter at reasonable times upon any private or public property for the purpose of inspecting and investigating conditions relative to the enforcement of these Regulations upon verbal notice and after presenting official identification to the permittee, owner, occupant, custodian, or agent of the property owner. 1.3	Enforcement and Penalties. The provisions of these Regulations shall be enforced by the Department as provided in Chapter 60 of Title 7 of the Delaware Code. Such enforcement may include but is not limited to revocation of the violator’s well permit for cause. The failure of the Department to enforce any of the provisions of these Regulations in one case does not constitute a waiver by the Department of any such provisions or right to enforce such provisions in other cases. “Abandoned Well” means a well that is not being used for its intended purpose as determined by the Department. “Absorption Facility” means a system of open jointed or perforated piping, alternative distribution units or other seepage systems for receiving the flow from septic tanks or other treatment facilities and designed to distribute effluent for oxidation and absorption by the soil within the zone of aeration. “Agricultural Well” means a non-potable well used for watering livestock, aquaculture, or watering household yards and gardens, or for other purposes related to farming, but not for irrigating lands or crops. “Annular Space (Annulus)” means the space between a borehole and well casing or between concentric well casings. “Applicant” means the owner or owners of the property seeking a well permit, or his or her legally authorized agent. “Aquifer” means a part of a formation, a formation, or a group of hydraulically connected formations that contains sufficient saturated permeable material to yield economically useful quantities of water to wells and springs. “Aquifer Interconnection” means a condition that exists when a well is screened or gravel packed across multiple aquifers. “Aquifer Storage and Recovery (ASR) Well” means a well that is used for artificial recharge of an aquifer to store water for withdrawal usually during peak demand. "Aquifer Test" means a test conducted by influencing and observing changes in hydraulic head in an aquifer. "Available" means a public water distribution line or service connection exists within 200 feet of the foundation of the structure or building. “Beneficial Use” means any use of water that is necessary to the applicant, reasonably non-wasteful, reasonably non-damaging to other water users, and in the best interest of the public as determined by the Department. "Call in Authorization Number" means a randomly generated number provided by the Department to the well drilling contractor, that is linked to the well permit number, that conveys the intent to construct the well, and that is required to validate the well permit. "Certificate of Public Convenience and Necessity (CPCN)" means an authorization issued by the Delaware Public Service Commission for the delivery or provision of a public service to a designated area or parcel of land. “Confined Aquifer” means a saturated layer of permeable geologic material bounded above and below by confining layers and where its water pressure is everywhere greater than atmospheric. “Confining Layer” means a stratum of impermeable or distinctly less permeable material stratigraphically adjacent to one or more aquifers. “Consolidated” means geologic material that is firm and rigid due to the interlocking or cementation of its mineral components. "Construction Well" means a non-potable temporary well used solely to supply water for well construction. “Contaminant” means any substance, either man-made or natural, that degrades or impairs water quality. “Contamination” means the presence of a contaminant in the environment. “Department” means The Department of Natural Resources and Environmental Control (DNREC). "Dewatering System" means mechanical equipment used to remove groundwater from an excavation for construction purposes. Equipment consists of a pump, intake and discharge piping, and wells, well points, sumps, or excavations. “Dewatering Well” means a well that is used to remove groundwater for construction or installation of, but not limited to, footings, sewer lines, building foundations, elevator shafts, underground storage tank installations and the like. “Disinfection” means the inactivation of pathogenic organisms in water by chemical oxidants, ozone, ultraviolet light, or similar treatments. “Disposal Area” means the entire area used for the absorption facility. “Domestic Well” means a well that may serve no more than three dwellings and is used for potable non-public water supply purposes and may be used for non-potable household purposes. “Drawdown” means the extent of lowering of the static water level in a well and of the water table or potentiometric surface adjacent to a well, resulting from the discharge of water from a well. “Drilled Well” means a well that is constructed using auger, rotary or percussion tools that cut, fracture, or abrade the surface of the earth. “Drive Shoe” means a device fastened to the bottom of a length of casing to aid in driving the well casing. “Driven Well” means a well that is constructed by means of pushing or hammering a casing and screen including direct push methods, and that does not create an annular space. “Dug Well” means a well that is constructed by the use of picks, shovels, or an excavator. "Fire Protection Well" means a non-potable well used for emergency purposes only and not connected to a public water supply distribution system. "Geophysical Log" means a record of various properties of the formation, borehole, or well obtained by electrical, mechanical, electromagnetic, or other measuring devices. “Gravel Pack” means processed gravel or coarse sand placed in the annular space surrounding the well screen to limit the entrance of particulates. “Groundwater” means any water naturally found under the surface of the earth. “Grout” (noun) means material that is capable of providing a seal in the annular space of a well, or for sealing. "Grout" (verb) means to emplace grout (noun) in an annular space of a well. "Heat Pump" means a device that transports thermal energy from one environment to another, and in either direction. “Heat Pump Closed Loop Well” means a borehole containing a vertical pressurized circuit of pipe that circulates a water-based solution to exchange heat with groundwater. "Heat Pump Direct Exchange (DX) Well" means a borehole containing a pressurized circuit of tubing that circulates a refrigerant to exchange heat with groundwater. “Heat Pump Recharge Well” means a non-potable well that is used to inject groundwater heat pump effluent back into an aquifer. “Heat Pump Supply Well” means a well used to withdraw groundwater for thermal exchange in a heat pump and that may also be used for potable supply. “Industrial Well” means a non-potable well that is used in the processing, washing, packaging, or manufacturing of a product excluding food and beverages. “Injection Well” means a well that is used to place fluid into the subsurface as regulated by the Regulations Governing Underground Injection Control. “Irrigation Well” means a non-potable well that is used for watering lands or crops other than household lawns and gardens. "Jetted Well" means a well that is constructed using a high velocity stream of water. "Lysimeter" means a device for withdrawing pore water samples from the unsaturated zone and that does not intersect the water table. “Miscellaneous Well” means a non-potable well used for beneficial purposes but that is not included in any other well categories defined by these Regulations, and that is not connected to a public water system or private home. “Monitor Well” means a non-potable well that is used primarily for collecting groundwater samples. “Multiple Screens” means the use of more than one screen, or of a continuous screen, in well construction, connecting multiple water-bearing zones within a single aquifer. “Observation Well” means a non-pumping, non-potable well used for measuring groundwater levels or the potentiometric surface. "Operator" means the person responsible for the operation of a well or water system. “Person” means any individual, firm, association, organization, partnership, business trust, corporation, company, contractor, supplier, installer, user, or owner, or any Federal, State or local governmental agency or public district or any officer or employee of these. "Piedmont Physiographic Province" means the land area consisting of rolling hills composed of crystalline rocks located north of a line drawn between Newark and Wilmington. “Piezometer” means an alternate word for observation well. “Pitless Well Adapter” means a device designed for attachment to one or more openings through a well casing, provided with a pitless well cap, and so constructed as to prevent the entry of contamination into the well. “Pitless Well Cap” means a device that encloses the upper termination of the well casing above a pitless well adapter or unit and provides for connections for electrical power lines and a screened well vent. “Pitless Well Unit” means a pre-assembled device that extends the upper end of a well casing to above grade, provided with a pitless well cap, and so constructed as to prevent the entry of contamination into the well. “Potable Water” means any water that is in compliance with all the required drinking water standards specified in the Delaware Regulations Governing Public Drinking Water Systems and the US EPA Safe Drinking Water Act, and that is acceptable for human consumption. “Potential Source of Contamination” means anything that may introduce a contaminant that could cause water to fail to meet applicable water standards. Examples may include, but are not limited to, underground storage tanks for petroleum products, absorption facilities, wastewater disposal areas, landfills, confined animal feed lot operations, and storm water management facilities. “Pressure Grouting” means the emplacement of grout materials under positive pressure by means of a conductor (tremie) pipe. "Community Water System (CWS)" means a public water system that serves at least 15 service connections used by year round residents or regularly serves at least 25 year-round residents. "Non-Transient Non-Community Water System (NTNCWS)" means a public water system that is not a community water system and that regularly serves at least 25 of the same persons over six months per year. "Transient Non-Community Water System (TNCWS)" means a public water system that has at least 15 service connections or regularly serves an average of at least 25 individuals daily at least 60 days out of the year. "Miscellaneous Public Water System (MPWS)" means a public water system that is neither community, transient non-community, nor non-transient non-community. “Public Well” means a well that is used to supply water to more than three dwelling units, 25 or more employees, or for the preparation or manufacturing of food or beverages, or to the public at large. “Pump Installer” means any person holding an appropriate license issued by the State of Delaware to act in responsible charge of all on-site work in the installation, modification, and repair of water pumps and related equipment. “Pump Installer Contractor” means any person licensed by the State of Delaware to engage in the business of contracting for the installation, modification, and repair of water well pumps and related equipment. “Pump Pit” means an underground enclosure that contains pumping equipment external to the well, and may also contain the well and other water system components. “Recovery Well” means a well that is used to withdraw contaminants or contaminated groundwater. “Regulations” mean Delaware Regulations Governing the Construction and Use of Wells. “Sealing” means removal of pumping equipment, if applicable, and emplacing grout the entire length of a well so as to make it permanently decommissioned. “Secretary” means the Secretary of the Department of Natural Resources and Environmental Control or the Secretary’s duly authorized designee. “Septic Tank” means a watertight receptacle that receives the discharge of wastewater from a structure or part of a structure and is designed and constructed so as to permit settling of solids from the liquid, digestion of the organic matter by detention, and discharge of the liquid portion into an absorption facility. “Service Connection” means a water line from a water supply system to a dwelling or building. "SIRS" means the Department's Site Investigation and Restoration Section. “Soil Boring” means a borehole for the purpose of determining the physical or chemical characteristics of soil or sediment. “Source of Contamination” means anything that is known to have introduced a contaminant that has caused a violation of applicable water quality standards. Examples may include but are not limited to underground storage tanks for petroleum products, wastewater disposal areas, landfills, confined animal feed lot operations and storm water management facilities. “Static Water Level” means the elevation of water in a well not under the influence of pumping. “Suction Line” means a pipe that conveys water from a well by a pump creating negative pressure. “Test Well” means a temporary well installed to determine the lithology and water transmission properties of an aquifer or geologic materials and that may be used to determine water quality. “Unconfined Aquifer” means an aquifer where no relatively impermeable layer exists between the water table and the ground surface and the water surface is at atmospheric pressure. “Unconsolidated” means not cemented as in soil, sediment, or other geologic material. "Unrecorded Well" means an existing well for which the Department has no record. “Water Well Contractor” means any person licensed by the State of Delaware to engage in the business of contracting for the construction and repair of wells, and contracting for the installation or repair of well pumps and related equipment. “Well” means any excavation that intersects the water table, and is installed for the purpose of obtaining geologic or hydrologic information and for locating, testing, measuring, extracting, or recharging water and other fluids, and where the depth is greater than the width. Such excavations may have been drilled, augured, cored, bored, driven, dug, jetted, or otherwise constructed. This definition does not include excavations for dewatering trenches, utility poles, construction pilings, building foundations, fence posts, test pits, or horizontal heat pump systems. “Well Casing” means a closed-wall pipe used to provide access from the ground surface to a water-bearing unit. "Well Development" means the process of removing fine material from the well to improve yield and water quality. “Well Driller” means any person licensed by the State of Delaware to act in responsible charge of all on-site work relating to the drilling, construction, development, and testing of wells; well alteration and repair, test boring and coring; and the installation, modification, and repair of well pumps and related equipment. “Well Driver” means any person licensed by the State of Delaware to act in responsible charge for all on-site work relating to the driving, construction, development, and testing of driven wells; alteration and repair of driven wells; and the installation, modification and repair of water well pumps and related equipment ordinarily used in driven wells. “Well Pit” means an underground enclosure that contains a well head that is capped below grade. "Well Point" means a shallow well that is typically used in series with a manifold and pumped together by suction to dewater an excavation. “Well Screen” means a filtering device (e.g. manufactured perforated pipe) used as a sediment filter allowing entrance or exit of sub-surface fluids. “Wick Drain” means a prefabricated strip that is inserted into the ground for draining water and consolidating compressible soils or sediments. 3.1.1	A well may not be constructed until the Department has issued a well permit and a call-in authorization number unless otherwise authorized under subsection 3.13. A well permit is not required for the construction of hand augured soil borings or other soil borings that do not intersect the water table (such as direct push soil borings). 3.1.2	A lysimeter may not be constructed until the Department has issued a well permit number. Lysimeters shall be constructed or repaired by qualified professionals as approved by the responsible program and are not required to be installed by a licensed well driller or driver. 3.1.3	A well permit is required for the construction and use of all wells and lysimeters. 3.2	Well Repair. A well permit is not required for the repair or rehabilitation of a well or associated equipment, provided the physical dimensions of the well are not changed, pursuant to subsection 9.3. A change in physical dimensions or exceedance of original capacity shall require an application for a well permit as set forth in the remainder of this Section. 3.3	License Required. The construction, repair, modification, or sealing of wells shall be performed by or under the direct on-site supervision of a licensed well driller or well driver. The installation of well pumps and pumping equipment shall be performed by or under the direct on-site supervision of a licensed pump installer, plumber or well driller. Except as permitted by 7 Del.C. §6023, the above referenced persons shall be licensed under the requirements of the Delaware Regulations for Licensing Water Well Contractors, Pump Installer Contractors, Well Drillers, Well Drivers, and Pump Installers. 3.4	Permit Preparers. All well permit applications shall be prepared and submitted by a Delaware licensed well driller or driver pursuant to subsection 3.1. 3.5.1	All applications shall be made on Department provided paper or electronic forms. 3.5.2	All applications shall be legible and complete, including such plans, specifications, and other relevant information for review by the Department. All applications must include evidence of property ownership in the form of a zoning verification, settlement agreement, tax assessor's record, or an easement or access agreement showing the applicant's authority to construct a well, or the authorized agent for government owned lands. In the event an outstanding issue is identified during the Department's review that renders the application incomplete, the Department will return the application to the preparer along with a letter describing what information or material is missing. 3.5.3	All applications shall be signed by the applicant or their legally authorized agent or be attested to by the permit preparer for electronic applications. The applicant may be penalized for submitting false information. 3.5.4	All applications shall be signed by the permit preparer. The permit preparer may be penalized for submitting false information. 3.5.5	All applications shall be accompanied by an application fee and an advertisement fee, if applicable. 3.5.6	Wells shall only be used for the purposes designated by the permit. 3.5.7	The Department will not consider the issuance of a permit for a potable water supply well on an undeveloped parcel until the on-site wastewater treatment and disposal system permit for the parcel has been issued, or central sewer service is available to the parcel, except in the case of a water utility or municipality when it is shown that no sewer service or on-site wastewater treatment and disposal is necessary for the parcel. 3.5.8	For wells which will be constructed in areas where no tax map numbers are assigned, a utility or safety permit shall be submitted with the application. 3.6.1	Applications for dewatering systems shall be submitted on forms supplied by the Department. 3.6.2.5	Maximum daily quantity of water to be pumped in gallons and peak rate in gallons per minute. 3.6.3	Permits are valid for the duration of the project as described in the application. The operation of the dewatering system authorized by the permit shall cease on or prior to the expiration date of the permit. 3.6.4	The Department may require additional information concerning the operation of the dewatering system prior to issuance of the permit. 3.6.5	Withdrawals from dewatering systems are subject to the requirements of subsection 3.12.12 of these Regulations. 3.6.6	Water quality tests may be required as part of the application, at the discretion of the Department, where the Department has reason to believe that groundwater contamination may exist in or near the proposed construction site. 3.6.7	The owner of the dewatering system may be required to analyze the extent of potential impact to other permitted water users and submit the findings to the Department. 3.6.8	The owner of the dewatering system may be required to provide reasonable assurance that the operation will not cause erosion at the point of discharge or introduce unacceptable turbidity into the receiving water body. 3.6.9	Applications for multiple well points may be submitted on a single form provided that all well points are located on a single tax parcel and are identical in construction. For deep dewatering wells using submersible pumps, and sumps, separate applications are required for each. 3.7.1	A separate application is required for each well and each application shall show the total number, diameter, and spacing of injection wells for the entire system. The Department may require additional plans or drawings showing the overall operation of the injection system. 3.7.2	The Department will not issue well construction permits for wells that require a separate permit from the Underground Injection Control (UIC) program until the UIC permit is issued unless otherwise approved by the Department. 3.8.1	The application shall show the total number, diameter, and spacing of vertical loops for one system on one form. The Department may require an additional site plan showing all closed loop locations for commercial-scale projects. 3.9.1	Applications for monitor and observation wells (piezometers) and soil borings that intersect the water table shall be submitted on forms provided by the Department. 3.9.2.3	All wells or soil borings are screened in the same aquifer. 3.10.1	A permit to continue use is required when the Department has determined that an unrecorded well exists. 3.10.2	Applications for permits to use unrecorded wells shall, to the extent practicable, contain the same information as required in an application for a permit to construct a new well. 3.10.3	Unrecorded wells shall meet the requirements contained in these Regulations for the applicable well classification prior to being permitted. 3.11.1	Upon receipt of a complete application and the appropriate fee, the Department may consider approving a request to change an existing well from one classification to another. 3.11.2	Wells proposed for reclassification must meet the requirements contained in these Regulations for the proposed well classification. 3.11.3	Test wells may only be reclassified to observation, monitoring, or irrigation wells upon approval by the Department. 3.11.4	The Department may specify additional conditions with the reclassification that may include, but are not limited to, the conditions contained in the original well permit. 3.12.1.1	Any permit application or combination of applications located on the same tax parcel, where the total estimated withdrawal is greater than 1 million gallons per day shall be advertised in newspapers of local and statewide circulation with a comment period of 15 days before issuance of the well permit(s). Fire protection wells are exempt from this requirement. 3.12.1.2	If the well permit has expired, or the requested water usage rate has increased, or well construction details or source aquifer has changed, then a new well permit application will be required. If the water usage rate has increased to over 1 million gallons per day, re-advertisement will be required. 3.12.1.3	The Department at its sole discretion and upon receipt of sufficient justification may issue the permit prior to the expiration of the above comment period on a case-by-case basis. In such cases the owner will be proceeding at their own risk with the permit still subject to public hearing requirements. 3.12.2	The Department shall take into account the hydrogeology, effect on water levels, sources of contamination, water quality, population density, water use, and other factors as may be relevant in the area of the proposed well to protect the water resources of the State and for the protection of human health. 3.12.3	The Department, in its discretion, may specify additional permit conditions including, but not limited to double casing, specialized grouting, water use or depth restrictions, advance notification prior to construction, special material requirements, geophysical logging, water quality sampling, and formation sampling. 3.12.4.3	The permit applicant is a resident of a municipality, county water district authority, or a recorded development where public water is available. A public water supply is deemed reasonably available when a public water distribution line is located within 200 feet of the foundation of the structure or building being served. 3.12.5	Subsections 3.12.4.2 and 3.12.4.3 do not apply for permits for potable wells for a farm, farmlands, or the lands of an existing mobile home community. 3.12.6	The Department shall not withhold an application for a permit for a non-potable well in an area serviced by a water utility under a CPCN. 3.12.7	When a proposed potable, agricultural, heat pump, or miscellaneous well is to be located within the jurisdiction or service area of a municipality serving public water, the applicant shall include a written statement of approval from said municipality with the well permit application. 3.12.8	When a proposed potable, agricultural, heat pump, or miscellaneous well is to be located within the CPCN of a private public water provider, the Department shall notify the public water provider in writing. 3.12.9	The Department may require aquifer tests as a condition of certain well permits. These tests may require the construction and use of one or more observation or monitor wells. Aquifer tests shall be conducted in accordance with published aquifer test procedures. 3.12.10	An application that is denied pursuant to these Regulations will be returned to the preparer along with a letter of explanation, and a copy to the applicant. 3.12.11	All wells shall be used for their intended purpose and withdrawn water shall be put to beneficial use. If a well is not used for its intended purpose, the Department may order it to be properly sealed. 3.12.12	All wells and dewatering facilities are subject to 7 Del.C. §§6031 and 6037 that mandates responsibilities concerning water supply depletion or water quality degradation of any existing use of water caused as a result of any operation authorized under the permit. 3.13.1	An emergency circumstance is deemed to exist when a well is replacing a failed well and when the Department determines that the lack of water poses an immediate danger to the health or welfare of persons or when the Department, in its discretion, has determined that other exceptional circumstances exist. 3.13.2	A permit number may be issued verbally during business hours for the installation of a well installed due to an emergency pursuant to subsection 3.13.1. If the well permit number is issued prior to well installation of the well, the driller must obtain an authorization number from the Department to validate the well permit. Within 72 hours after issuance, the driller shall submit an application, applicable fee, and completion report. The Department may grant an extension to the completion report time frame upon request. 3.13.3	For an emergency when State offices are closed, a well may be constructed provided that the Department is notified on the first business day following such action. The driller shall submit an application, application fee, completion report, and sealing report for the replaced well, by close of business that day except for emergency replacement wells for irrigation wells that must be submitted within 72 hours after the Department has been notified. The Department may grant an extension to the completion report time frame upon request. 3.13.4	All wells constructed under emergency circumstances shall be constructed in conformance with these Regulations. 3.13.5	Any well that is constructed under emergency circumstances will not have been reviewed by the Department pursuant to subsection 3.12.2. The driller must inform the owner that construction is at the owner's risk. The Department's review may result in the well being ordered sealed and relocated. 3.14.1.3	The permit does not contain a condition that prohibits relocation. 3.14.2	The unsuccessful well, cased or uncased, shall be sealed pursuant to Section 10.0. The unsuccessful well shall be sealed concurrent with, or prior to, the construction of the relocated well. 3.14.3	Call in authorization must be canceled if the drill rig is removed from the site prior to construction of the relocated well. A new call in authorization number must be obtained prior to resuming construction. 3.14.4	The relocated well location must be clearly shown on the completion report. 3.14.5	Monitor, observation, or recovery wells or soil borings shall only be relocated within the boundary of the site plan accompanying the permit application(s). 3.15.2	Resubmit the original application showing the revised location, initialed by the well driller. 3.16	Cancellation of Permits. The Department shall have the right to void any permit for a well that has not yet been constructed for the protection and conservation of the water resources of the State or to protect public health as determined in the Department’s discretion. 3.17	Permit Duration. A permit shall be valid for a period of one year from the date of issuance by the Department during which time the well may be constructed provided the call in authorization number has been obtained, except as required in subsection 3.6.3. 3.18	Permit Extension. A permit extension request may be approved by the Department not to exceed two years from the original date of issuance. 3.19.1	Well permits are issued for construction and use, except as noted in subsection 3.19.2 and 3.19.3. 3.19.2	Any well or combination of wells located on the same parcel, where the total estimated yield or use is greater than 50,000 gallons per day are not authorized for use. Prior to putting the well into service the applicant, as defined in the Regulations Governing the Allocation of Water shall apply for a Water Allocation Permit. Fire protection wells are exempt from this requirement. 3.19.3	Prior to the use of a public well, the water supplier shall obtain approval from the Division of Public Health. 3.19.4	The Department may consider approving a request to change an existing well from one classification to another pursuant to subsection 3.11. 3.20	Permit Transfer. A well permit is not transferable unless approved by the Department with written request by the owner. 3.21	Water Service Piping. Water service piping from the well to the structure(s) shall be installed in accordance with the requirements of the Delaware Regulations Governing a Detailed Plumbing Code, administered by the Division of Public Health. 4.1.1	The water well contractor and well driller shall ensure construction of the well in accordance with the conditions of the permit and applicable laws and Regulations. 4.1.2	The well driller is required to have a paper or electronic copy of the well permit, permit number, and authorization number on site. In the case of emergency replacement wells approved verbally during office hours, the well driller is required to have the permit number and authorization number on site. In the case of an emergency replacement well that is constructed when State offices are closed, a permit number and an authorization number are not required. The driller and applicant must comply with subsection 3.13.3. 4.1.3	The well driller shall attach the well identification tag supplied by the Department prior to demobilizing, with the exception of an emergency well pursuant to subsection 11.2. 4.1.4	Upon completion of the well, the water well contractor shall submit to the Department a legible well completion report and formation log pursuant to Section 8.0. 4.1.5	If a driller, other than the preparer of the application, constructs the well, that driller must obtain an authorization number prior to construction of the well. 4.2.1	The property owner shall maintain the well in accordance with these Regulations and in compliance with all applicable permit conditions including, but not limited to, maintenance of the upper terminus and identification tag. 4.2.2	The property owner is responsible for having any damage to the well repaired by a license well driller. 4.2.3	The property owner shall have a failed or abandoned well properly sealed by a license well driller pursuant to Section 10.0. The well must be sealed within 15 days of construction of a replacement well. If the well is not sealed at the end of this period the Department may have the well sealed at the well owner's expense. A replaced well may be retained if the Department approves the continued use or reclassification of the well pursuant to subsections 3.10 and 3.11. 4.3	Pump Installer Contractor Responsibilities. The pump installer contractor, or their licensed employee, shall install, repair, or replace pumps to maintain the well in accordance with the conditions of the permit, manufacturer’s recommendations, and applicable laws and Regulations. 5.1.1.1	100 feet from identifiable potential or existing sources of contamination with the exception of public wells. Exceptions to these requirements for all wells other than public wells are addressed in subsections 5.1.1.2, 5.1.1.3, 5.1.1.4, 5.1.1.5, 5.1.1.6, and 5.1.1.8. Public wells shall have a minimum separation distance of 150 feet except as addressed in subsections 5.1.1.5, 5.1.1.6, and 5.1.1.7. 5.1.1.2	50 feet from identifiable potential or existing sources of contamination for heat pump recharge, heat pump closed loop, and heat pump direct exchange wells pursuant to subsections 6.4.2 and 6.5.1. 5.1.1.3	50 feet from any boundary of an Agricultural Lands Preservation District (as defined in 3 Del.C. Chapter 9) for any parcel, lot, or subdivision. Wells on parcels, lots, or subdivisions created or recorded prior to April 6, 1997 are exempt. The Department requires that all wells be placed the maximum distance possible from lands where federally regulated chemicals have been applied. Pesticides that have been applied in accordance with their respective pesticide product label and are not associated with any known contamination are exempt. 5.1.1.4	100 feet from the absorption facility, 50 feet from septic tanks, diversion valves or boxes, dosing chambers, holding tanks, or grease, except as allowed by subsection 5.1.2. 5.1.1.5	50 feet from any underground sewer forced main or gravity sewer lines but no less than ten feet if the well is constructed in a confined aquifer or if cased and grouted to a minimum of 100 feet below ground surface except public wells. Public wells shall be located the maximum distance possible allowed by the well site, but no less than 75 feet from an underground sewer forced main or gravity sewer lines. The Department may approve a lesser distance on a case by case basis for public well sites provided the well can be screened in a confined aquifer or can be cased and grouted at least 100 feet below land surface. Sewer laterals are not to be interpreted as forced main or gravity sewer lines. 5.1.1.6	50 feet from the absorption facility of a residential septic system that has been decommissioned as documented by the Department. 5.1.1.7	10 feet from a property line to allow access to the well without encroaching on adjoining properties except as required in subsection 5.1.1.8. All wells may be constructed less than 10 feet from a property line if approved by the Department for the purpose of maximizing other horizontal separation distances as required by this Section and avoiding public utilities. The applicant shall provide a notarized form provided by the Department and signed by the property owner that documents the reason(s) for the request. 5.1.1.8	150 feet within the outer most property lines of the housing development for public wells within a housing development recorded on or after April 6, 1997. 5.1.2.1	The separation distance shall be maximized but no less than 50 feet, provided the well is screened in a confined aquifer and pressure grouted from either the top of the gravel pack to the ground surface, or from the bottom of the casing to the ground surface (e.g., crystalline rock, consolidated open-borehole wells), except those wells specifically exempted in subsection 5.8.7. In the event that a confined aquifer is not encountered within 150 feet of the ground surface, the well will be required to be cased and grouted to a minimum of 100 feet below the ground surface unless more specific aquifer confinement is required by the Department. 5.1.2.2	Where any public water supply well cannot satisfy the separation distance requirements of subsection 5.1.1.1, the Department at its discretion may approve an alternate siting and/or construction method(s) and must follow the requirements of Section 12.0. 5.1.3	No wells shall be located within any dedicated State of Delaware right-of-way unless a utility or safety permit is submitted with the application. 5.1.4	The Department may approve a lesser separation distance for an agricultural well from an existing or potential source of contamination but the separation distance shall be maximized and shall be no less than 50 feet. 5.1.5.1 Pressure lines shall be at least 10 feet from all identifiable potential or existing sources of contamination. Pressure lines that must cross a gravity sewer line shall be double cased at least 10 feet on either side of the intersection of the water line with the gravity sewer. 5.1.5.2	Suction lines shall be at least 50 feet from all identifiable potential or existing sources of contamination. 5.1.5.3	Double-cased suction lines shall be at least 10 feet from all identifiable potential or existing sources of contamination. 5.1.5.4	A well may not be constructed within or under any building other than a structure constructed specifically for the housing of the well and related equipment, unless otherwise approved in writing by the Department. Such structures shall be identified on the exterior with the permit number of the well contained therein. 5.1.6	All wells shall be located so as to be accessible for cleaning, treatment, repair, testing, inspection, and any other work. 5.1.7	All wells shall be protected from surface water run-off and flooding pursuant to subsection 5.11. 5.1.8	The Department may require special location and depth requirements for a proposed water supply well to minimize its exposure to identifiable potential or existing sources of contamination or interference with other water supply wells. The submission of drawdown data and capture zone analyses may also be required to justify the location and depth of the well. 5.1.9	Wells subject to flooding pursuant to subsection 6.2.1 are subject to the additional siting requirements contained in subsection 6.2.2. 5.2.1	During well construction of the well, the well and any aquifers shall be protected against contamination. 5.2.2	Whenever construction stops prior to well completion, the open annular space or open borehole shall be covered and protected from surface water drainage. The well casing shall be capped in accordance with the requirements of subsection 5.11. 5.2.3	Whenever contamination is detected during drilling, and the contamination was not anticipated by the Department and addressed in the permit conditions, the well driller shall cease work and notify the Department at (800) 662-8802. Drilling may commence upon approval by the Department. 5.2.4	If contaminants are encountered during drilling, the well driller shall decontaminate the drilling equipment to prevent the transfer of contaminants into uncontaminated aquifers or from the site. 5.3.1.1	A public water supply system meeting the requirements of the Delaware Regulations Governing Public Drinking Water Systems. 5.3.1.2	Any other potable water supply. 5.3.1.3	Other non-potable water supply wells such as irrigation or construction wells. 5.3.2.1	Water from a potable source shall be maintained with a free chlorine residual of one milligram per liter (mg/L). 5.3.2.2	Water from a non-potable well shall be disinfected with one pound of calcium hypochlorite per 1,000 gallons of water. At least 30 minutes contact time shall elapse between addition of the disinfectant and use of the water. Sodium hypochlorite in the form of laundry bleach (5.25 percent available chlorine) may be used in lieu of calcium hypochlorite. 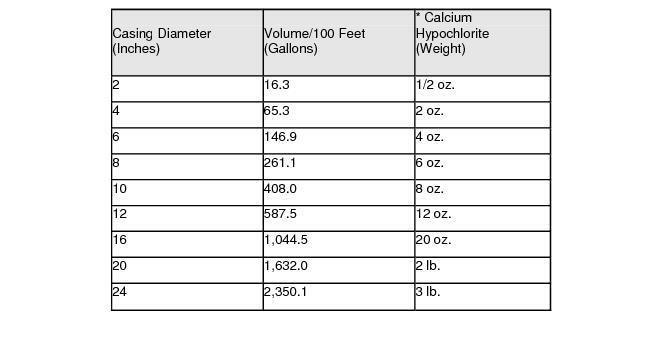 One and seven tenths (1.7) gallons of laundry bleach are equivalent to one pound of dry calcium hypochlorite. 5.3.3.1	The Department may issue a permit for a construction well to supply water for a new well installation. The application for a construction well should be submitted in conjunction with the application for a new well. 5.3.3.2	All construction wells shall be sealed pursuant to Section 10.0 prior to the demobilization of the drill rig. 5.4.1	Drilling fluids shall consist of water-based or air-based fluids containing only additives manufactured for water well drilling. 5.4.1.1	If rapid loss of drilling fluid occurs, clean fill material such as sand, gravel, crushed stone, or drilling fluid additives manufactured for lost circulation may be used in the zone or zones where the loss is occurring. 5.4.2	The Department may set drilling fluid specifications for fluid viscosity and specific gravity. The Department may require that a report of drilling fluid characteristics be submitted with the completion report. 5.4.3	The use of polymers is permitted to increase viscosity and filtration control in drilling fluids. 5.5.1	Well casing shall be strong enough to resist the forces imposed on it during and after installation, following applicable specifications established by the American Petroleum Institute, American National Standards Institute, and the American Society for Testing and Materials. 5.5.2	Casing must not cause the delivered water to be toxic or violate state or federal drinking water standards, following the specifications established by the National Sanitation Foundation. 5.5.3	Casing other than polyvinyl chloride (PVC) or steel shall only be used with the written approval of the Department. 5.5.4	Polyvinyl chloride (PVC) casing shall be a minimum of Schedule 40 unless otherwise approved by the Department. 5.5.5	For wells with a diameter greater than six inches, the water well contractor shall account for conditions such as installation depth that may require heavier-weight well casing. 5.5.6	Steel casing shall be used for wells constructed in crystalline rocks. 5.5.7	Steel casing shall be a minimum of at least Schedule 40 unless otherwise approved by the Department. 5.5.8	The Department may require that casing used for water supply wells be at least four inches in diameter. The Department may require that casing used for public supply wells be at least six inches in diameter. 5.5.9.1	Overall casing length shall be no less than 20 feet. Monitor, observation, recovery, wick drains, dewatering, and large diameter bored wells are excluded from this requirement. Required casing heights above ground surface are specified in subsection 5.11. 5.5.9.2	Wells (except monitor, observation, dewatering, and recovery wells) located on tax parcels less than one-half acre in size and where an on-site wastewater treatment and disposal system is or will be utilized, shall be cased to a minimum depth of 42 feet below land surface. 5.5.9.3	Wells completed in a confined aquifer shall be cased to the top of or into the source aquifer. 5.5.9.4	Wells sited pursuant to subsection 5.1.1.6 shall be cased to a minimum depth of no less than 42 feet below land surface. 5.5.10.1	Joints for all well casing shall be water tight and joined in accordance with the manufacturer's recommendations. Joints for steel well casing may be electrically welded or threaded. Joints for polyvinyl chloride (PVC) well casings shall be solvent welded or threaded. All couplings and solvents shall meet ANSI/NSF Standard 14, ASTM F480 or similar requirements. 5.5.10.3	Where steel well casing is required, the casing shall be equipped with a drive shoe that shall be firmly seated by driving it into the rock prior to continuation of drilling or grouting. 5.6.1	All wells that obtain water from unconsolidated aquifers shall be equipped with a well screen that will limit the entrance of sediments. 5.6.2	Wells finished in consolidated aquifers are not required to be screened. 5.6.3	Well screens shall have sufficient structural strength appropriate for installation. 5.6.4	The screen shall be sized to meet the screen manufacturer's specifications. 5.6.5	Only commercially manufactured well screens, constructed of materials resistant to damage by chemical action of groundwater or cleaning agents, shall be used in the construction of a well, unless otherwise approved by the Department. 5.6.6	Lead packers and lead swedges are prohibited. 5.6.7	The bottom of the well screen shall be closed. 5.6.8	Aquifer interconnection, as determined by the Department, is prohibited. 5.7.1	Gravel shall be free of foreign matter, well sorted, and properly sized. The gravel shall be disinfected as it is placed into the well annulus in one continuous operation. 5.7.2	Bulk gravel shall be covered and stored to prevent direct contact with the ground. 5.7.3	The placement of gravel into the annulus shall completely encase the well screen and prevent grout from entering the screen after settlement. The Department may require gravel placement with a tremie pipe, as needed. 5.7.4	Placement of gravel that causes interconnection of aquifers, as determined by the Department, is prohibited. 5.7.5	Gravel must not extend more than 10 feet above the top of the screen in single cased wells unless otherwise approved by the Department. 5.7.6	Gravel may be used to fill the annulus of geothermal closed loop wells from the bottom of the borehole to the bottom of the overburden only in the Piedmont physiographic province. 5.8.1	All wells shall be grouted from the top of the gravel pack to the ground surface unless specifically exempted in subsection 5.8.7 or otherwise approved by the Department. 5.8.2	The annulus shall be a minimum of 1.5 inches wide (diameter of bore hole = outside diameter of casing plus three inches). Wells used for the purpose of groundwater monitoring or observation shall have a minimum annulus of 0.50 inches wide (diameter of borehole equals the outside diameter of the casing plus one inch). 5.8.3	All wells shall be grouted within 24 hours after the casing has been set. 5.8.4	Wells 40 feet or less in depth that are constructed in unconfined aquifers, may be grouted by pouring chipped or pelletized bentonite into the annulus. For wells deeper than 40 feet in depth, the annulus shall be pressure grouted from top of the gravel pack to ground surface. For exceptions, see subsection 5.8.13.2. 5.8.5	For single-cased wells constructed in confined aquifers, the casing shall be pressure grouted from the top of the gravel pack to ground surface. 5.8.6	Geothermal closed loop and direct exchange wells shall be pressure grouted from the bottom of the bore hole to the ground surface. 5.8.7	Wells with casing depths of 20 feet or less are not required to be grouted, except monitor, observation, recovery wells, and wick drains less than 20 feet in depth may be required to be grouted. 5.8.8	The use of drill cuttings between the gravel pack and the required grout depth for domestic, public, and heat pump supply (potable) is prohibited. 5.8.9	The water well contractor may be required to notify the Department in advance of grouting. If the Department has scheduled a grouting inspection, the driller is not permitted to proceed with grouting unless otherwise instructed by the Department. 5.8.10	Cement grout must be allowed to cure for a minimum of 24 hours from the completion of grouting before well construction activity, including development, can be resumed. 5.8.11	The Department may specify additional conditions pertaining to the grouting of any well. 5.8.12.1	Cement may be neat Portland or quick setting (hi-early) cement in a ratio of no more than six gallons of water per 94 pound bag of cement. Sodium based bentonite may be added to the cement grout in an amount not to exceed five pounds per 94 pound bag of cement. 5.8.12.2	Bentonite grout is a sodium based bentonite with a ratio of not less than two pounds of bentonite per gallon of water. Bentonite clay without additives shall not be used where it comes in contact with groundwater with a pH less than five or having a total dissolved solids content greater than 1,000 milligrams per liter (mg/L) without Department approval. 5.8.12.3	Thermally enhanced bentonite grout is a sodium-based bentonite silica sand mixture with a ratio of not less than 1.5 pounds of bentonite per gallon of water containing no more than 300 pounds of sand per 50 pounds of bentonite. Sand shall be "000" well gravel or range between 50 and 70 mesh containing a minimum of 95% silica having a uniformity coefficient not greater than 1.7. 5.8.12.4	If rapid loss of grout material occurs during emplacement, clean fill material such as sand, gravel, crushed stone, or cement additives manufactured for lost circulation may be used in the zone where the loss is occurring. 5.8.12.5	Use of polymers is permitted to slow the hydration of bentonite. 5.8.12.6	All water used for grouting shall be treated to achieve a minimum pH of 8.0 with soda ash (sodium carbonate (Na2C03)) or other industry recognized products. 5.8.13.1	Well grouting shall be performed to provide a water tight seal that prevents fluid migration into the annulus of the well. 5.8.13.2	All single-cased wells shall be grouted from either the top of the gravel pack to the ground surface, or from the bottom of the casing to the ground surface (e.g., crystalline rock, consolidated open-borehole wells), except those wells specifically exempted in subsection 5.8.7. 5.8.13.3	If the annular space cannot be grouted in accordance with these Regulations, the well shall be sealed pursuant to Section 10. 5.8.13.4	The top of grout shall be at the base of the well’s discharge line for wells equipped with pitless adapters, pitless well unit, or plumbing “Tees”. 5.8.13.5	Grouting requirements for multiple-cased wells shall be determined on an individual basis. 5.9.1	Development shall be performed until formation cuttings, mud, and drilling fluids or other additives are completely removed from the well and surrounding aquifer. 5.9.2.2	Has a turbidity of less than 10 NTU (Nephelometric Turbidity Units), except when the turbidity is due to the oxidation of naturally occurring dissolved iron or manganese. 5.10	Pitless Well Adapters, Pitless Well Units, and Plumbing "Tees"
5.10.1	A pitless well adapters or pitless well units shall be installed on all potable wells having a submersible pump or deep well ejector jet pump. 5.10.2	For suction lift systems where the well casing is used as a suction line and for heat pump recharge wells, a standard plumbing "Tee" connector and extension pipe with cap may be used in place of a pitless well adapter or pitless well unit, providing the extension meets the requirements pursuant to subsection 5.11. 5.10.3	All pitless well adapters or pitless well units shall be of a type approved by the National Sanitation Foundation, the Water Systems Council, or the Department. 5.10.4	Connections of the pitless well adapter, pitless well unit, or plumbing "Tee" to the well casing and lateral connections of piping shall be watertight. 5.10.5	A pitless well adapter, pitless well unit or plumbing "Tee" shall be installed in conformance with depth of water service piping requirements pursuant to subsection 3.21. 5.11.1	For flood-prone wells, the top of the well head or pitless well unit shall be no less than 24 inches above ground surface, or the highest known flood level, whichever is greater. 5.11.2	For domestic and agricultural wells, the top of the well head, or pitless well unit shall be no less than eight inches above the finished ground surface or pump house floor unless otherwise approved by the Department. 5.11.3.1	A locking well cap. 5.11.3.2	For PVC casing - a concentric, protective steel casing firmly set in concrete. The Department may waive this requirement for specific projects (such as, small on-site wastewater treatment and disposal systems). 5.11.4	For public, irrigation, and industrial wells, the top of the well head or pitless well unit shall be no less than 18 inches above the finished ground surface. 5.11.5	For wells and well points used for dewatering, the top of the well head or takeout shall be no less than 12 inches above the finished ground surface. 5.11.6	Monitor and observation wells may be terminated below finished ground surface upon approval by the Department. 5.11.7	The Department may require additional protective devices such as bollards in high traffic areas. 5.11.8	Well pits, pump pits and buried well seals are prohibited. Upon approval by the Department, potable wells may be terminated below finished ground surface if above grade completion is not feasible. The engineered design of the enclosure must be included with the application or submitted prior to modification of an existing well. 5.11.9	All wells shall be securely covered except during construction and testing. Caps shall be lockable or removable only with tools. If a cap cannot be used, an alternative method for securely covering the well shall be employed. 5.11.10	Any time an existing well is identified as not meeting the requirements of this Section, the well head shall be brought into compliance unless otherwise approved by the Department. Wells permitted prior to the effective date of these Regulations are exempt. The Department may impose these requirements upon the reclassification of any well. 5.12.1	All wells with a pumping capacity greater than 50,000 gallons per day shall be constructed with an access port and tube. 5.12.2	All public wells that supply a community water system and all industrial wells shall have a capped access port and tube. A transducer may be installed in addition to the access port and tube. 5.12.3	If the pump motor is not installed directly over the well, the access port shall be located directly on top of the well. 5.12.4	If the pump motor is installed directly over the well, an access port pipe shall be installed through the pump base or outside the well casing at some accessible point below the base of the pump. 5.12.5	The access port and tube shall have a minimum inside diameter of three-quarters inch. 5.12.6	The access port shall be constructed to prevents the entrance of water, dust, insects, or other foreign material, and allow access for water level measurements. 5.12.7	The use of air line gauges for water level measurement is prohibited. 5.13.1	All wells with a design capacity greater than 50,000 gallons per day shall be permanently equipped with a meter or meters capable of acquiring instantaneous flow rate and totalized flow measurements accurate to within five percent of the actual flow rate, unless otherwise approved by the Department or pursuant to subsection 5.13.2. Flow rate indicators may consist of any combination of test dials and direct reading indicators. 5.13.2	Irrigation wells and non-potable wells constructed and used for fire protection with a design capacity greater than 50,000 gallons per day shall be permanently equipped with an elapsed time meter, readable in hours or minutes, equipped on the well's drive engine or motor to measure actual hours of operation. If an irrigation well has been determined by the Department to be located in an area at risk for saltwater intrusion or where demands may exceed supplies, the Department may require the well to be permanently equipped with a meter or meters capable of acquiring instantaneous flow rate and totalized flow measurements accurate to within 5 percent of the actual flow rate. 5.13.3	All public and industrial wells shall be permanently equipped with a meter capable of acquiring instantaneous flow rate and totalized flow measurements accurate to within five percent of the actual flow rate, unless otherwise approved by the Department. 5.13.4	A backflow protection device shall be installed in a pumping system containing a well if the pumping system is connected to a treatment system, is used to convey wastewater, fertilizers, chemicals, or provides fire protection pursuant to subsection 6.3.3. 5.13.5	Water systems that draw from more than one aquifer shall have a backflow prevention device on the discharge line of each well to prevent the introduction of water that is not native to the source aquifer. 5.13.6	The proposed withdrawal rate shall be consistent with the pump capacity, well design, and the intended use of the well. 5.13.7	Well vents shall be covered with corrosion-resistant mesh screen and down-turned to prevent the entrance of surface water, insects, or other foreign material. 5.13.8	Upon completion of installation, the driller or pump installer shall disinfect the well and pump in accordance with Section 7.0. 6.1.1	Well construction materials and methods must be compatible with the monitoring program objectives. 6.1.2	Wells must be constructed to allow for characterization of geologic materials and sampling. The Department may place additional requirements on wells that are used as part of a specific environmental program. 6.1.3	Wells located within a Delaware Department of Transportation (DelDOT) right-of- way must be enclosed in a curb box, flush mounted with the ground surface with a six-inch wide cement apron around the perimeter of the curb box. No well shall be placed on highway travel lanes, on auxiliary travel lanes or on roadway shoulders. The well owner is responsible for having these wells sealed upon notification from either the Department or DelDOT. 6.1.4	Applications for wells in areas described in this Section must have the words "Zone of Interest" clearly marked on the application. 6.1.4.2	Telephone poles and DelDOT fence lines. 6.1.4.3	Two feet between the sidewalk and road from the roadside edge of the sidewalk. 6.1.5	PVC screens for monitoring petroleum hydrocarbons must have a slot width no less than 0.020 inches. Screens for all other applications must have a slot width no less than 0.010 inches. 6.1.6	Monitor wells must not be disinfected without prior written approval from the Department, except for monitor wells used for bacterial sampling. 6.1.7	In the event that contaminants are encountered during the drilling process, the water well contractor shall decontaminate the drilling rig and related apparatus to prevent the transfer of contaminants from the site. 6.1.8	Contaminated fluids and drill cuttings derived from drilling, developing, or sampling of monitor wells shall be properly containerized and disposed of by the water well contractor or other designated party. 6.1.9	The Department may require the elevations of the tops of monitoring and observation wells, excluding the caps, be established with reference to mean sea level datum or a common datum, as appropriate, to determine the direction of groundwater flow and related groundwater elevations to other available points. The surface used for this measurement must be permanently marked. 6.2.1	Standards set forth in this section are for wells in areas prone to wave action or flooding. These coastal areas are shown on Flood Insurance Rate Maps published by the Federal Emergency Management Agency and are designated as "A" or "V" zones. 6.2.2	Wells constructed in flood-prone or coastal areas shall be completed pursuant to subsection 5.11.1. 6.2.3	Wells constructed on waterfront properties shall be constructed on the landward side of the property, unless otherwise approved by the Department. 6.2.4	Well construction beyond the Department's coastal building restriction line as defined in the Delaware Regulations Governing Beach Protection and the Use of Beaches is prohibited. 6.3.1	The well owner shall be responsible for posting the Department well identification number on the exterior of the well enclosure. 6.3.2	All public wells for community water systems and all industrial wells must be logged by a qualified geophysical logging operator. The suite of logs shall include natural gamma, spontaneous potential, and resistivity. Other logs may be required by the Department. 6.3.3	Public wells shall be equipped with a backflow preventer, raw water sample tap, and a pump-to-waste valve on the discharge line of each well prior to the pre-storage isolation valve. 6.4.1	All water obtained from wells supplying a heat pump system shall be injected into the source aquifer. Where the requirements of subsections 6.4.4 and 6.4.5 have been met, and the aquifer will not accept the water from the supply well, the Department may approve an alternate method at its discretion. 6.4.2	No heat pump recharge well may be constructed within 50 feet of any identifiable potential or existing source of contamination. Decommissioned septic systems are not a potential or existing source of contamination for heat pump recharge wells. 6.4.3	Other than thermal alteration, groundwater recharged to the aquifer shall be in its natural condition. 6.4.4	The diameter and screen length of all heat pump recharge wells shall be equal to or greater than the diameter and screen length of the heat pump supply well, unless otherwise approved by the Department. 6.4.5	Where a heat pump recharge well meets the requirements of subsection 6.4.4 and the receiving aquifer will not readily accept the return flow, another well will be required. 6.5.1	No heat pump closed loop or direct exchange wells shall be constructed within 50 feet of any identifiable potential or existing source of contamination. Decommissioned septic systems are not a potential or existing source of a contamination for heat pump closed loop or direct exchange wells. 6.5.2	The solution contained in the heat pump closed loop well piping system shall be free of characteristic hazardous substances with the exception of ethanol-base antifreeze solutions designed for such systems. The use of non-toxic propylene-glycol-based antifreeze solutions is recommended. 6.5.3	Refrigerant prohibited by the Environmental Protection Agency shall not be used in direct exchange wells. 6.5.4	Prior to being connected to a manifold, the ends of the loop shall be temporarily sealed by fusion or capping. The use of tape is prohibited. 6.5.5	All buried pipe shall be marked with underground warning tape at a depth of 24 inches. 6.5.6	Pressure testing of the closed loop heat pump system network shall be conducted prior to putting the system into operation. 6.6.1	Miscellaneous wells shall be subject to construction conditions as determined by the Department. 6.7.1.2	The well is not permitted at any time to be interconnected with any portion of any building's plumbing or any water utility's service connection. The well must be available at any reasonable time for inspection by personnel of the Department pursuant to subsection 1.2.8 and the water utility serving the certificated area to ensure there are no interconnections. 6.7.2	The well permit shall be subject to revocation upon any violation of the above requirements and, upon revocation, the Secretary shall order that the well be sealed. 7.1.1	Disinfection of all newly constructed or repaired wells, in accordance with subsection 7.2 is required, except as noted in subsection 7.1.6 and 7.1.7. 7.1.1.1	After disinfection of each new, modified, or reconditioned public well, one or more water samples shall be submitted to a certified laboratory for microbiological analysis with satisfactory results reported to the Division of Public Health prior to placing the well into service. 7.1.2	After any repair or maintenance to the well, pumping equipment or piping, or other system components, those components shall be disinfected. For domestic wells, the entire plumbing system shall be disinfected. 7.1.3	Bacteriological sampling and testing after the repair or maintenance of potable wells is required. Disinfection shall be repeated until bacteriological results meet applicable standards. 7.1.4	Calcium hypochlorite (National Sanitation Foundation/American National Standards Institute (NSF/ANSI) Standard 60 Drinking Water grade or equivalent) shall be used for disinfection unless otherwise approved by the Department. 7.1.5	Continuous disinfection directly into a well while in service is prohibited. 7.1.6	Monitor wells shall not be disinfected without prior written approval of the Department except for monitor wells used for bacterial sampling. 7.1.7	Dewatering wells shall not be disinfected unless specifically required as a condition of the well permit. 7.1.8	The Department may require specific disinfection procedures for deep wells with a higher pH, turbidity, lower temperatures, iron, organic matter, ammonia, or other chemical constituents that interfere with disinfection. 7.1.9	New public wells shall not be put into service until they are tested and approved for use by the Division of Public Health. 7.2.1	The following procedures shall be followed when disinfecting wells, unless otherwise approved by the Department. 7.2.2	Calcium hypochlorite (NSF/ANSI Standard 60 Drinking Water grade or equivalent) sufficient for a dosage of at least 100 milligrams per liter (mg/L) free available chlorine shall be emplaced into the well screen. 7.2.3	After the pump has been installed, the chlorine solution shall be fed through the entire supply line to waste until chlorine is detected. If the concentration is less than 100 milligrams per liter (mg/L), more calcium hypochlorite (NSF/ANSI Standard 60 Drinking Water grade) shall be added to the well until such concentration is reached. 7.2.4	The inside of the well above the static water level shall be disinfected with the chlorine solution for 30 minutes. If granular disinfectant is used, the interior metal surfaces of the well casing above the static water level shall be inspected, and any granules shall be rinsed prior to closing the well. 7.2.5	If the well is connected to a public distribution system, the chlorinated water shall be pumped to the permanent disinfection unit, if present, or to the end of the water main where it is isolated from the remainder of the distribution system and can be blown off. The well contractor shall coordinate public distribution system disinfection with the Division of Public Health. 7.2.6	If the well is connected to a residential system, the chlorinated water shall be pumped until chlorine is detected at each tap, unless otherwise approved by the Department. 7.2.7	Disinfectant shall be in contact with the well components and any distribution system components, pursuant to subsections 7.2.5 and 7.2.6, a minimum of 24 hours, and not to exceed 48 hours. 7.2.8	If the free chlorine residual is less than 5 milligrams per liter (mg/L) after 24 hours, the procedure pursuant to subsection 7.2.7 shall be repeated. When the free chlorine residual is at least five milligrams per liter (mg/L) after 24 hours, the well and distribution system shall be pumped to waste. 7.2.9	Total chlorine must be absent from the system before collecting the bacteria sample. 7.2.10	Should the well fail to be disinfected as determined by the Department; the Department may require other measures such as re-disinfection, repair, or sealing. 7.2.12.1	Read the calcium hypochlorite label carefully and follow all safety and storage instructions. Calcium hypochlorite should always be added to water. Never add water to calcium hypochlorite. 7.2.12.2	The use of calcium hypochlorite warrants strict adherence to all applicable safety measures and utilization of proper protective equipment. The Department assumes no liability attendant to the handling, use and storage of calcium hypochlorite. 8.1.1	A well completion report and formation log shall be submitted to the Department in a format provided by the Department, not later than 30 days after the construction of any well, except as required in subsection 3.13.3. 8.1.2	Each completion report shall be signed by the well driller or well driver in direct on-site supervision of the well construction. 8.1.3	Failure to submit well completion reports as required by this Section shall result in the denial of additional well permits. 8.1.4	The completion report shall include the results of all testing required in the permit. 8.1.5	If geophysical logs were generated, the completion report shall include two copies of each log. 8.1.6	An illegible or incomplete completion report will be returned to the preparer. 8.1.7	If the well location is different from that proposed on the application, the new location shall be drawn and noted on the completion report. 8.1.8	For wells in unconsolidated sand and gravel aquifers, the well formation log shall include notation of the sediments type, grain size, color, texture, accessory materials, thickness, and depth of individual layers or lenses, and other distinctive features. 8.1.9	For wells in crystalline rock, the well formation log shall include the rock type (such as schist, gneiss, marble), color, hardness, texture, veining, and all other distinctive features, including depth interval, and estimation of flow rate of all water-bearing zones as encountered during drilling. 8.1.10	For non-vertical wells, the angle and direction of drilling shall be noted on the completion report, and a site plan showing the top and bottom of the well included in the report. 9.1	All repairs of the internal components of a well shall be performed by or under the direct supervision of a Delaware-licensed well driller or well driver. Repair of pumps, may be performed by a Delaware-licensed pump installer or plumber, except as provided in subsection 9.2. 9.2	A person owning or leasing land with an agricultural or irrigation well may perform their own pump repair on those wells only. 9.3	The repair of any well must not modify the original construction specifications, except relining well screens. 9.4	Repair of any well having a buried well head shall include the extension of the well casing above ground pursuant to subsection 5.11, unless otherwise approved by the Department. 9.5	The repair of any industrial, public, or irrigation well shall include the installation of a water level access port and tube pursuant to subsection 5.12, if applicable. 9.6	Well screen relining or changing capacity of the pump for public, irrigation, and industrial wells requires the submission of a new completion report pursuant to Section 8.0. 10.1.1	The sealing of a well shall be performed only be a Delaware licensed well driller or well driver. 10.1.2	Within 30 days of the sealing of a well the water well contractor shall submit a well sealing report to the Department, in a format provided by the Department. The report shall be completed and signed by the well driller or well driver supervising the site work. 10.1.3.7	The well was installed illegally. 10.1.4	A well that interconnects aquifers shall be sealed unless otherwise approved by the Department. 10.1.5	The Department may require or approve specific sealing procedures. 10.1.6	The Department may require prior notification of the date of sealing. 10.1.7	All wells being replaced, with the exception of public wells, shall be sealed within 15 days of completion of the replacement well unless approval for retaining the replaced well is granted by the Department pursuant to subsection 3.11. Public wells shall be sealed within 30 days of completion of the replacement well. 10.1.8	Wells that are unsuitable for their intended use shall be sealed pursuant to subsection 10.3 or reclassified pursuant to subsection 3.11. 10.1.9	A well will not be considered sealed if only the supply line is sealed. 10.2.1	Only concrete, Portland cement, sodium-based bentonite clay, or combinations of these materials or other materials approved by the Department shall be used to seal a well. 10.2.2	Only drill cuttings, clay, silt, sand, gravel, and crusher run are considered acceptable fill material and may only be used pursuant to subsections 11.3.6, 11.3.7, or 11.3.8. 10.2.3	Portland cement grout and sodium-based bentonite clay grout shall meet the requirements pursuant to subsections 5.8.12.1 or 5.8.12.2. 10.3.1	Prior to sealing, the well driller or well driver shall determine the condition of the well, its construction, and obstructions that may interfere with sealing. Obstructions shall either be removed or eliminated through the process of over-drilling, if necessary. 10.3.2	Well casing not to be removed shall be cut off at or below grade. 10.3.3	The Department may require that the well casing be ripped, perforated, or removed entirely to ensure that any previously un-grouted annular space or voids are filled with sealing materials. 10.3.4	All wells shall be sealed with the appropriate sealing materials by pressure grouting through a tremie pipe from the bottom of the well upward to the ground surface, except as noted in subsections 10.3.6, 10.3.7, or 10.3.8 unless otherwise approved by the Department. 10.3.5	When Portland cement grout or concrete is used as a sealing material, it shall be emplaced in one continuous operation until grout returns to the surface. 10.3.6	A dug well larger than 24 inches in diameter shall be filled and sealed by placing fill material in the well to a level approximately five feet below land surface, and placing sealing material above the fill. The top one foot of the well may be covered with fill material. 10.3.7	For wells penetrating fractured or cavernous rock, coarse fill materials may be used to fill the cavernous portions of the well. The well shall be sealed from the bottom of the well to the cavernous zone and from the top of the cavernous zone to the land surface. 10.3.8	Dewatering wells and shallow monitoring or observation less than 20 feet deep and two inches in diameter shall have the entire casing removed unless otherwise approved by the Department. After removal of the casing, the wells shall be sealed or filled with drill cuttings. 10.3.9	Soil borings or uncased wells less than 20 feet deep shall be sealed or filled with drill cuttings or bentonite or cement grout. 11.1	Upon completion of the well and before leaving the site, the well driller, well driver, or pump installer shall fasten the well identification tag. The tag shall be permanently fastened to the well casing above finished grade by means of a one half or three-eighths inch stainless steel band or other device or method approved by the Department. The tag for a flush mount installation shall be permanently fastened to the top of the vault lid. The tag for an irrigation well with a concrete pad may be fastened to the pad. 11.2	The tag for a well permit issued by fax or under emergency circumstances shall be fastened to the well casing within five working days of the well driller's receipt of the tag. 11.3	Well tags shall be returned to the Department within 30 days of cancellation, revocation, or expiration of an unused permit, or the sealing of a tagged well. When an applicant is unable to meet the design criteria set forth in these Regulations for the siting or construction of a well, the applicant may seek the Secretary's approval for an Alternative Method of Compliance. 12.1	Applicability. Whenever a well can be constructed in accordance with the requirements of these Regulations that satisfies the applicant's needs, the Department shall require the applicant to construct the well in accordance with these Regulations. An applicant should not seek an Alternative Method of Compliance whenever the applicant can reasonably construct a well that will meet the applicant's needs and that satisfies the requirements of these Regulations. 12.2.4	A notarized letter executed by the applicant providing explicit documentation supporting the request for an Alternative Method of Compliance. 12.3	Public Notice and Hearing. 12.3.1	Public Notice. Public notice of Applications for an Alternative Method of Compliance shall be made in accordance with 7 Del.C. §6004. Applications for an Alternative Method of Compliance shall be advertised in a newspaper of general circulation in the county in which the activity is proposed and in a daily newspaper of general circulation throughout the State with a comment period of 15 days. 12.3.1.1.2	A source of water for three or few families. 12.3.2.2	The Secretary deems a public hearing to be in the best interest of the State. 12.4	Decisions on an Application for an Alternative Method of Compliance. 12.4.1.2	The well, as constructed, will not pose a risk to the lives, health, safety or welfare of those who will use the well, the environment, or to the occupants of this State. 12.4.2	Conditions. The Secretary may include reasonable conditions on the approval and operation of any well authorized to be constructed under this Section. Such conditions may include, but are not limited to, requiring the well to be constructed into a confined aquifer or other alternate depth, special grouting requirements, or monitored for water quality. 12.4.3	The Secretary's decision to approve an Alternative Method of Compliance shall only relieve the applicant from complying with those portions of the Regulations for which the Alternative Method of Compliance was approved. The applicant shall comply with the portions of the Regulations still applicable to approved well. Failure to comply with all applicable regulations and the conditions set forth in the Secretary's approval of the Alternative Method of Compliance shall be grounds to revoke the approval and may form the basis for an enforcement action, pursuant to 7 Del.C. §6005. Applications for and decisions on a variance request to any Section of these Regulations shall be made in accordance with 7 Del.C. §6011. 13.1.1	The Secretary may, upon application of a person, grant a variance to that person from any requirement of these Regulations after following the notice and hearing procedure set forth in 7 Del.C. §6004. 13.1.2.1	The Secretary may act upon a variance application without public notification where the variance application concerns a source of water for three or fewer families. 13.2.4	The continued operation of such source is necessary to national security or to the lives, health, safety or welfare of the occupants of this State. 13.3.2	A separate scaled plot plan of the area depicting distances from all potential or existing sources of contamination, as defined in Section 2.0 of these Regulations, within a 150 foot radius of all proposed public and industrial wells, and within a 100 foot radius of all other proposed wells. The plot plan shall also include all buildings, property lines, and all other physically limiting barriers such as overhead power lines. 13.3.3	The appropriate well permit application fee, if applicable, and advertising fee. 13.3.4	Written documentation evidencing compliance with subsection 13.1 and 13.2 of these Regulations and with 7 Del.C. §6011. 13.3.5	The property owner's signature on the written variance request that specifies the applicable Sections of these Regulations or of 7 Del.C. Ch. 60 for which a variance is being sought. 13.4.1	The Secretary shall publish his decision, except a decision involving a source of water for three or fewer families, and the nature of the variance, if granted, and the conditions under which it was granted. The variance may be made effective immediately upon publication. 13.4.2	Any party may appeal a decision of the Secretary on a variance request to the Environmental Appeals Board under 7 Del.C. §6008 within 15 days after the Secretary publishes his decision. 13.4.3	No variance can be in effect longer than 1 year but may be renewed after another hearing pursuant to this section. 13.4.4	The granting of a variance shall not in any way limit any right to proceed against the holder for any violation of the variance. Any rule or requirement of 7 Del.C. Ch. 60 or of these Regulations that is not incorporated in the variance provisions shall remain in full effect. 14.1	Any right to public hearings shall be held in conformance with the requirements of 7 Del.C. §6006. 14.2	Any right to appeal shall be in conformance to 7 Del. C. §6008. This regulation shall become effective September 11, 2016.